FILE - Protesters wearing yellow vests take part in a demonstration of the "yellow vests" movement in Marseille, France, Jan. 26, 2019. France's energy regulator is proposing a 5.9 percent increase in regulated power prices but faces opposition from the government which had promised not to increase the cost after the "yellow vest" protests. "We will use legal delays in order to protect households from too big an increase in their power bill at a time of high consumption," an environment ministry official said. 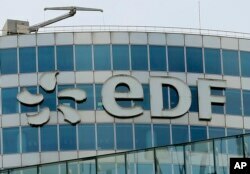 FILE - The EDF tower of French state-owned power giant Electricite de France (EDF), is seen in the La Defense business district, west of Paris. Thousands of "yellow vest" demonstrators again marched in Paris and other French cities last Saturday in protests that brought sporadic clashes with police and suggested that President Emmanuel Macron has yet to defuse public discontent after 11 weeks of demonstrations. The proposed increase would be the highest in years and would be applicable to the 25.6 million consumers who still subscribe to EDF's regulated tariffs. CRE said one way for the state to limit power bills would be to reduce the CSPE tax, which helps finance renewable energy subsidies and social tariffs for low-income families. It accounts for 15 percent of a consumer's bills, and raised 3 billion euros ($3.4 billion) last year.